Chiang Mai is famous for its culture, temples and markets. It’s a city that attracts visitors from all over the world, who look for the real Thailand. Not many consider it to be a romantic destination and they head to the islands for honeymoons and getaways with their loved ones. But do you know there are plenty of lovely things you can do here with your partner? 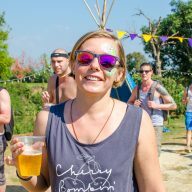 And if you happen to spend Valentine’s Day in Chiang Mai here is a list of things you can do and places you can visit. Thai people love flowers and they are the most popular gift for Valentine’s Day. What better way to celebrate it than take your other half for a walk in beautiful gardens. There are a few places worth visiting, like the Rajapruek Garden, where you will find large greenhouses and beautifully arranged exotic plants. Its central point is a beautiful temple, which is featured on many postcards and pictures from Chiang Mai. If you are a little bit more adventurous you can ride up to the top of Doi Suthep and stop at the Faculty of Agriculture owned by Chiang Mai University. 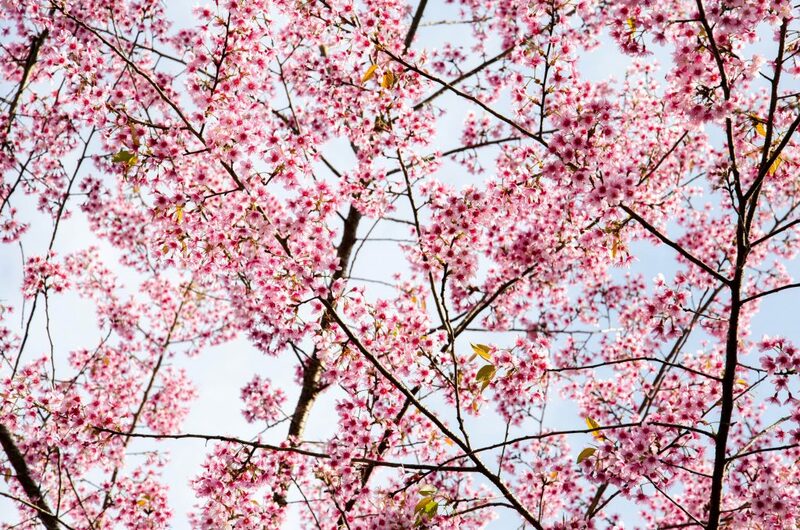 The beginning of the year is a great time to see cherry blossoms in Chiang Mai. Nothing more romantic than being surrounded by beautiful flowers. 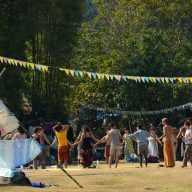 February is the time when it gets a little hotter in Chiang Mai and it’s always a good idea to take a trip outside of town. 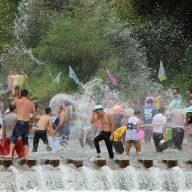 Spending some time at one of the waterfalls is a great way of celebrating Valentine’s Day in Chiang Mai. Mae Sa Waterfall is one of the biggest and most spectacular waterfalls in the area. Here you can swim in the cool water and have a nice picnic in on a rock, in the shade of the surrounding trees. Chiang Mai has over 300 temples and many of them are very quiet and hidden away from tourists. 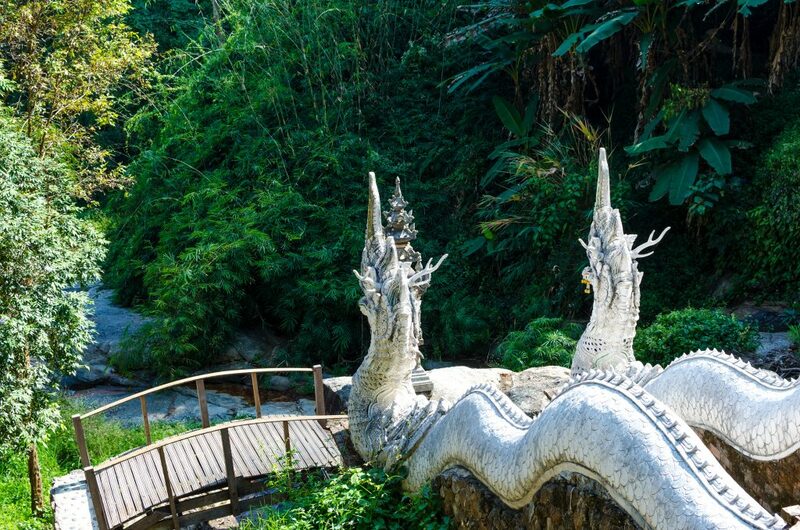 If you want to do some sightseeing, but you want to be alone and create a special atmosphere for yourself and your partner, then visit a place like Wat Pha Lat – a small temple in a jungle – or one of my other favourite 7 temples that I love to visit every once in a while. Wat Pha Lat is an amazing temple, situated on Doi Suthep. If you both love coffee almost as much as each other, then having an aromatic cup in one of Chiang Mai’s cafes is a great idea. There are plenty of places to choose from. My favourite place for a romantic afternoon is Mamia Cafe, which serves delicious coffee, tea and deserts and offers amazing views of the river and on the nearby temple. Taking your partner for a nice dinner is always a good idea. In Chiang Mai, there are plenty of romantic and stylish restaurants, where you can enjoy a beautiful, delicious meal. My favourite place for such occasions is Dash. I like it not only for its amazing curries and cheesecake but also for simple yet stylish decor and quiet and relaxed ambience. Valentine’s Day in Chiang Mai wouldn’t be complete without a river cruise. After a hearty meal, head to Riverside, a restaurant and bar, which offers good drinks and romantic cruises. From one of their long-tail boats, you can admire the city’s riverbank, which is always illuminated with lights and looks pretty from afar. 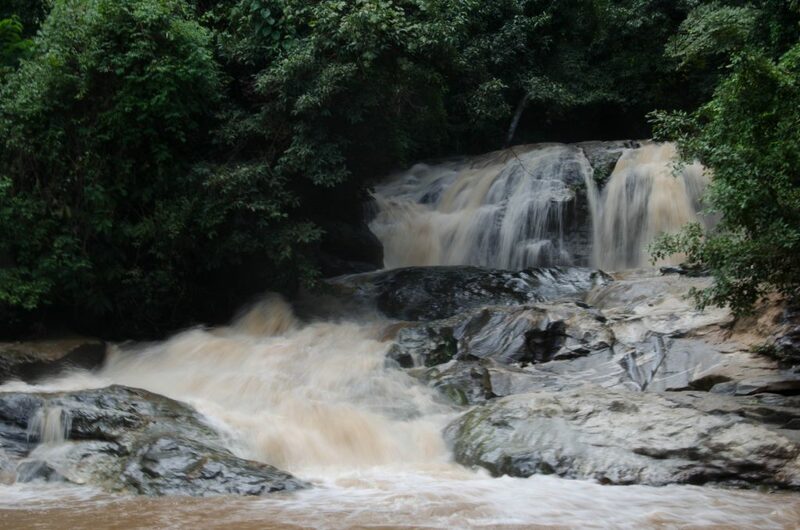 Spend your Valentine’s Day in Chiang Mai and visit one of the beautiful waterfalls. If you really want to impress your other half then take them to the viewpoint on Doi Suthep at night. You can drive there or take a taxi. 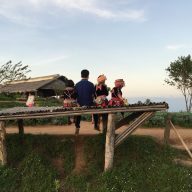 It’s a place where Thai couples like to come after sunset. The view over the city is amazing and it’s also slightly cooler here, so you can warm each other up. 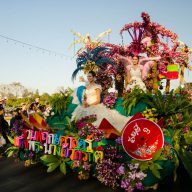 Valentine’s Day in Chiang Mai can be a really lovely experience. 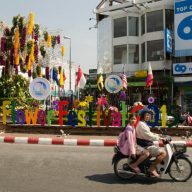 Thai people love that day and you will see a lot of decorations and flowers on the streets. The city has a lot to offer when it comes to ways of spending time with your loved one, whether that’s a dinner, or a hike in the jungle to reach a beautiful and quiet spot or a refreshing swim in a waterfall. It’s guaranteed that this day will be very special.